Why Colon Resection Is Needed? Colon resection, as the words indicate, refers to the surgery that removes a part of or the entire large bowel. 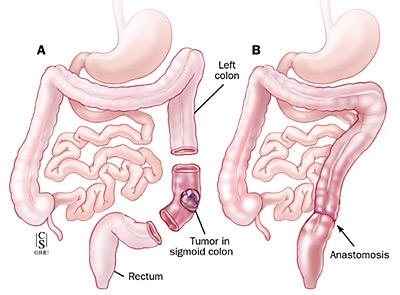 This article will guide you in detail about colon resection, its risks, implications, reasons why it is needed and other details you may want to know about. Colon resection is also known as colectomy or large bowel resection. It is a surgery designed to remove the infected portions of your large bowel, better known as the large intestine which comprises of numerous parts, including the colon. The surgeon takes out all the diseased portions of your bowel during the surgery and reconnects the healthy components. So during colon resection, the entire bowel or a part of it is removed. Surgeons may perform a colostomy if there isn’t sufficient healthy intestine left after the surgery. Colostomy refers to the procedure wherein an end of the large bowel is shifted outside your abdominal wall. A bag known as the colostomy bag is fastened to your abdomen and used for containing the stool that drains into it. Mostly, the colostomy is temporary and the bag is attached to the patient till their intestines recover. Another operation is done for removing it. There are several important things you need to do prior to your colon resection being performed. Inform your doctor of all the drugs, herbal remedies or supplements you are using, so they can advise you whether or not you should continue using them before the surgery. Do inform your doctor of an illness that you are suffering from previous procedure, such as herpes, fever, flue and cold. Discuss issues like your sexuality, intimacy, sports, work and pregnancy with your doctor before the procedure too. Around 2 weeks prior to your anterior resection, your doctor may ask you to quit taking drugs that are making it difficult for your blood to easily clot. These drugs include ibuprofen (Motrin, Advil), aspirin, Naprosyn (Naproxen, Aleve) and a few other medications. Ask your health care provider of the drugs you’re allowed to use till your surgery’s day. If you are a smoker, you need to quit this habit and discuss this issue with your doctor for getting expert advice. You must increase your intake of foods rich in fiber and drink around six to eight glasses of clean water daily. You would be provided with an intestinal prep a couple of days prior to bowel resection. You would be asked to drink fluids, take enemas and laxatives to ensure your colon is completely stool-free before the operation. Your doctor might ask you to drink clear liquids like clear juice, water or broth in the afternoon. Make sure to not consume any beverage or drink after midnight. At times, patients aren’t allowed to drink any beverage or water for around 12 hours prior to the low anterior resection. When the day of the procedure arrives, you must take all the medications advised by your doctor with a tiny sip of clean water. You will be informed of the right time to reach the hospital for the surgery. Colon resection removes some of your intestine out, which means it is some kind of surgery. Are you curious about how it is performed? Here explain this to you. During the laproscopeic colectomy procedure, a port or cannula is used by the surgeon for entering your abdomen via a tiny incision that measures smaller than about half an inch. Carbon dioxide in gaseous form is then pumped in your abdomen via the cannula for creating sufficient space inside your abdomen. A laproscope is placed via the port inside your large intestine. Around 4 more cannulas are inserted inside to allow the chief surgeon and their assistant to use specialized instruments and work inside your abdomen. The part of the intestine that needs to be discarded is freed from all the attachments with the organs or your abdominal wall. The blood vessels in charge of supplying to that portion are sealed with a special energy device. These vessels are then divided. An incision of one port is expanded a little and the unwanted portion of the colon is extracted right out of your abdomen. The remaining endings of the bowel are reconnected using sutures or surgical staples. During an open procedure, the surgeon works in a manner similar to the laproscopic colectomy, but does not employ a laproscope and uses traditional instruments. After your colon resection, you would need to stay in the health care facility for about 3 to 7 days. If the surgery took place in an emergency, you might be required to stay for a longer time period.Moreover, if a bigger portion of the small intestine had to be eliminated or in case you develop any serious complications, you would be asked to stay longer as well. You would be allowed to drink any clear liquid by the third day hopefully. Slowly, thicker fluids followed by soft foods will be added to your diet when your bowel can be ready to work properly once again. A few risks are also associated with general anesthesia such as breathing problems and allergic reactions to the drugs administered into your body. Server responsed at: 04/23/2019 8:01 p.m.